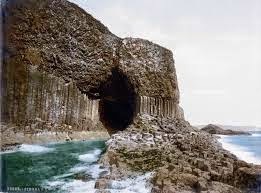 Fingal's Cave, on the island of Staffa off the west coast of Scotland (near Mull and Iona), is a sea cave formed within Tertiary basalt lava flows which have cooled to form hexagonal columns (like those of the Giants Causeway in Northern Ireland). There is a path in on one side which involves stepping from the top of one column to the next. The cave stretches 250 feet in to the rock and its roof is 70 feet above the sea. 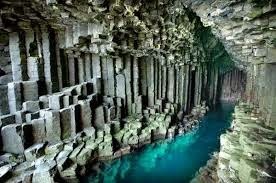 Fingal's cave was the inspriration for Mendelssohn's Hebridean overture. Staffa is one of the smallest islands in the Southern Hebrides that gets a separate page of its own on this website and not in the last place due to the presense of the famous Fingal's Cave. But apart from that, Staffa is a remarkable little island, located south-west off the isle of Ulva and halfway between the Ross of Mull and the Treshnish Isles. The island, small as it is with only 33 hectares, was once inhabited in the 1700s by as much as 16 people but nowadays seabirds and tourists have taken over their place. The 1700s were also the time that Staffa was part of the Ulva Estate but it was sold in 1777 and via several owners it was donated to the National Trust of Scotland by Jock Elliott from New York in 1986. Staffa is now a Site of Special Scientific Interest. Staffa, an entirely volcanic island, is probably best known for its unique geological features such as the many caves and the unique shape of the basalt columns which are also found in the Giant's Causeway and Rathlin island in Northern Ireland and closer by on the island of Ulva. It consists of a basement of tuff, underneath colonnades of a black fine-grained Tertiary basalt, overlying which is a third layer of basaltic lava lacking a crystalline structure. By contrast, slow cooling of the second layer of basalt resulted in an extraordinary pattern of predominantly hexagonal columns which form the faces and walls of the principal caves. The lava contracted towards each of a series of equally spaced centres as it cooled and solidified into prismatic columns. The columns typically have three to eight sides, six being most common. Tinkerbell Fairyfly: Do You Believe in Fairies?